Doing clay with fourth-graders in thirty minute classes is problematic. I know you are thinking, “Are you nuts?”, but it can happen. This lovely lesson from Ceramic Arts Daily filled the ticket with a cute little ceramic Jack-O-Lantern. We watched a short video on where clay comes from and what it is used for in every day life. https://www.youtube.com/watch?v=xhYWuAGVU8k My kids had no idea that things like sinks and toilets are made from ceramic. I portioned out the correct size balls of clay for each student before we began the project. I covered the work tables each day before they arrived. I demonstrated how to make a pinch pot. Students used sharpie to label a quart-sized sealable baggie with their name and class period. Whoa they were excited. Students made their pinch pots using a circle on their work table to measure their pot size. The idea was that it could be no bigger than the paper circle and that both pinch pots had to be approximately the same size. Both pinch pots went carefully back into the baggie until the next day. The students scored and slipped the edges of both pinch pots and joined them together. I gave each student a new portion of clay for the stem. They shaped and attached the stem. Using a sharpened pencil they carefully engraved their name on the bottom. I’ll admit it, I almost waited too long. The pumpkins were pretty hard when I went to carve the faces. I carved the eyes and the mouth with an X-Acto knife for each student. The idea of X-Acto knives and fourth graders made me a little queasy and to be honest I thought they might crush the pumpkins trying to carve through them. Air dry for at least 10 days or until bone dry and fire to bisque. Glaze and fire again. My students were so pleased with their Jack O’ Lanterns. I wrapped each one in tissue paper and hopefully they made it home in their backpacks in time for Halloween. As I have seen posted a lot over the past few days, teachers in the United States had the perfect storm this week; a full moon, Red Ribbon Week and Halloween coming. I felt gray hairs sprouting. But no, for my school, Travis Elementary, Friday was a happy day. We rocked. A little background. Red Ribbon Week, if you do not know, is a drug prevention week, first started to honor the sacrifice of DEA agent Enrique “Kikki” Camarena. Mr. Camarena was murdered in 1985 by the drug cartels in Mexico. 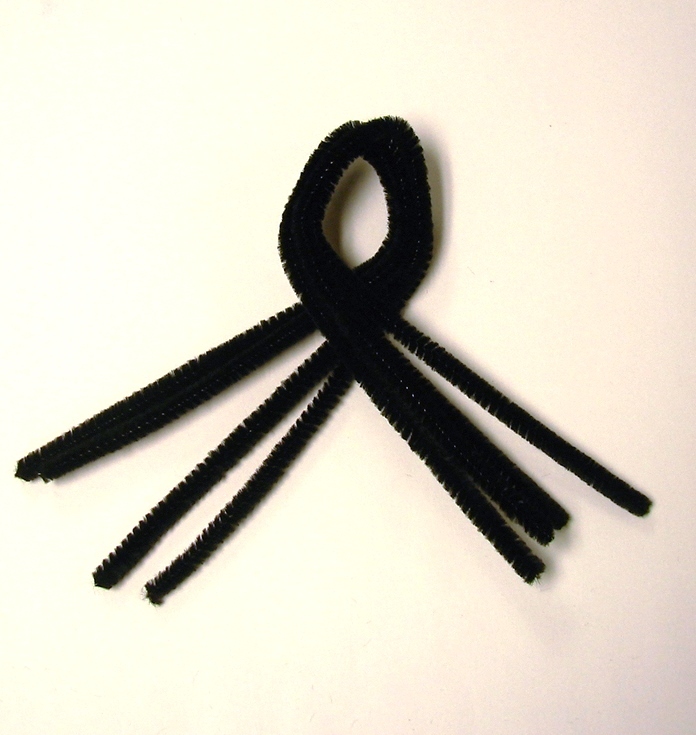 Red Ribbon Week is a way to honor his memory and teach the horror of drug use to children. Each day of Red Ribbon Week has a theme, drug prevention messages and a corresponding costume. 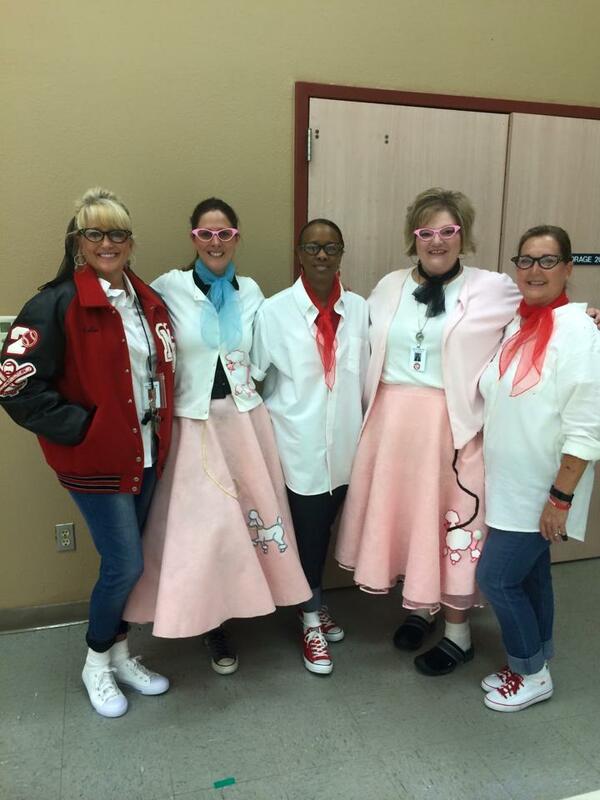 Friday was 50’s Day. Rock N Roll is our school theme this year, so that helped. Picture hundreds of miniature James Deans and Sandra Dees wandering the halls. Lots of poodle skirts and Pink Lady jackets. A few June Cleavers sprinkled in for spice. Lots of little guys in black jackets, white T-shirts with the sleeves rolled up and tucked into blue jeans. Our 4th, 5th and 6th graders had a special treat for their teachers. We had a 50’s flash mob. This goodie was presented through the hard work of our amazingly energetic and creative music teachers, Cody Jordan and Melanie Stubblefield, with the assistance of our P.E. teachers, Fredia Sneed, Arinda Crawford and Debbie Spoon. Our incredible Principal, Natalie Griffin gave the needed approval. Since September, these ladies have been teaching a short 50’s dance routine to “Rock Around the Clock” to all three grade levels. They would practice during P.E. class once a week and spring the surprise on Friday October 30th. The students did this in secret; no other teachers were to know the surprise. If you have ever tried to get over 200 students to do the same thing at the same time, you’ll get an idea of what an extraordinary feat this was. And a work out. These kids were sweating by the time they finished dancing and they were smiling. The plan was to have all grade levels, around 750 students, converge on the track infield and do this routine for their teachers. Alas, mother nature spoiled the plan with torrential rains on Friday. So each grade level got to do their surprise in the cafeteria for their teachers. 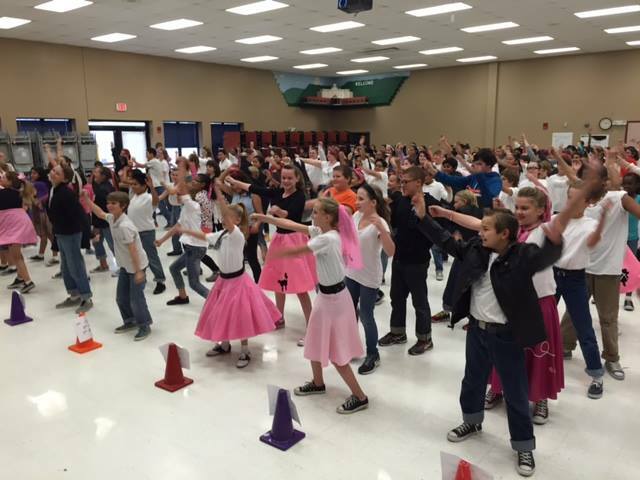 So Flash Mob 50’s Friday happened, and the joy of it was, they had a blast! That excess energy of the perfect storm week was put into exercise and a positive message instead of not so fun tricks. Mrs. Jordan tied it all up neatly by reminding the kids that they did this as a group as a gift to their teachers and that this was what it felt like to do things as a family. The Travis family. Rock N’ Roll! You are never too old for Halloween fun. Something about this holiday inspires you to be silly and creative. That is if you were raised with a Halloween like I was; where it was all about spooky stories, slightly scary but harmless costumes, hay rides, bonfires and trick or treat candy you did not have to check. Period. No other meanings implied or intended. 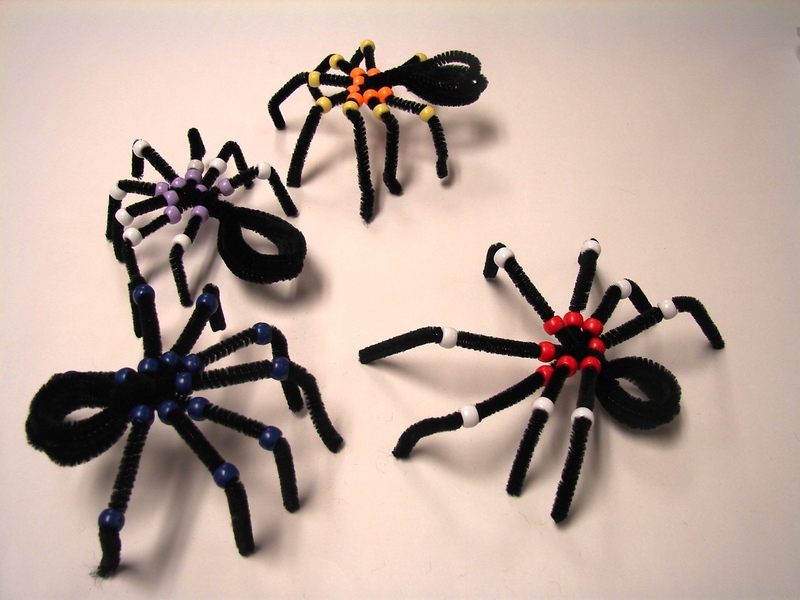 Having said that, I broke out the pipe cleaner spider project just as a way of reminding myself that the Halloween of the past can still be recreated in my room. 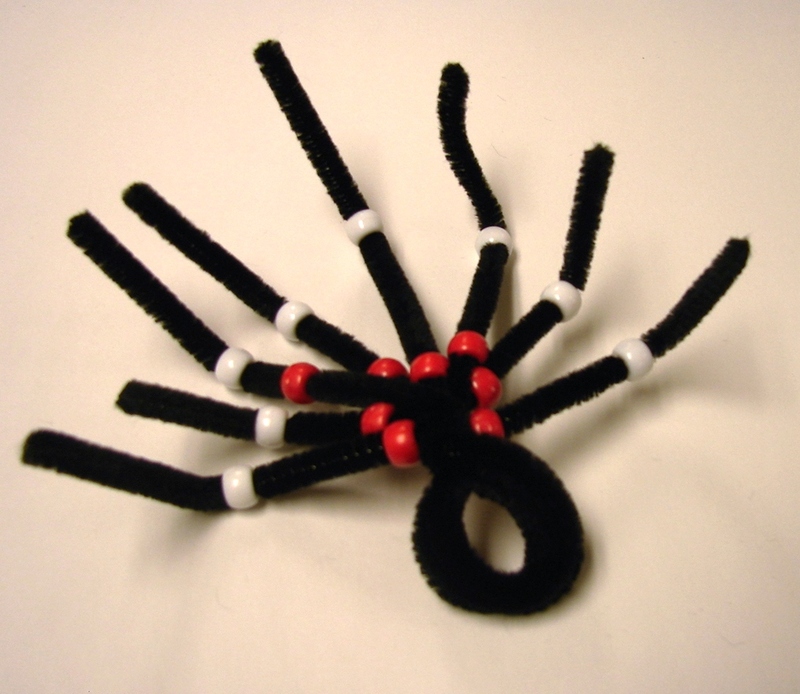 Yes, you can make a science curriculum connection in the study of arachnids…blah, blah, blah….I want to make slightly trembly spiders on hot glue spider webs, because they make people squeal and they are cute. Can we just be kids in the art room for a second? Okay. Here’s what you need for each spider. Here’s what you need for the spider web. 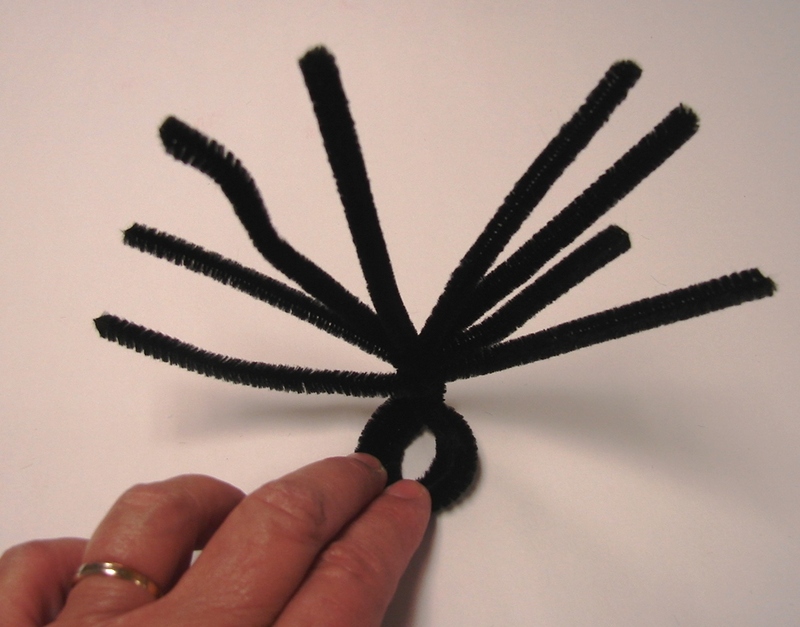 Get 4 pipe cleaners and bend in half. Cross over half the legs. make sure that the body loop is no bigger than a quarter. Short-legged spiders are not as cute. Twist the legs under the loop at least 3 times so the legs won’t come undone. Place the body of the spider on the table and bend the legs up so that you can separate 4 on each side. 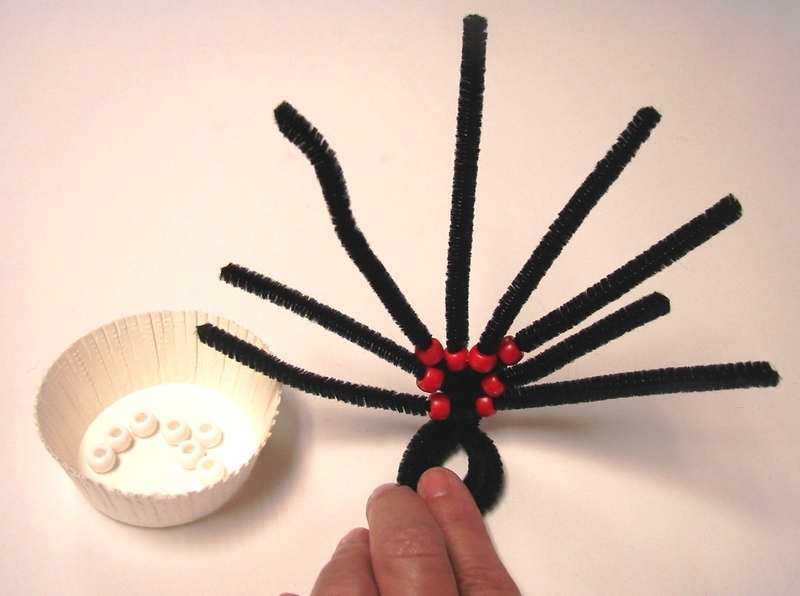 Add 8 of the beads close to the body. With the spider still on its back bend the knees in the same place on each leg and position the second bead on each leg above the knee. Turn the spider over and spread the legs for balance. 4 to the front, 4 to the back. By the way this fashion maven spider sports the Mineral Wells Ram colors. 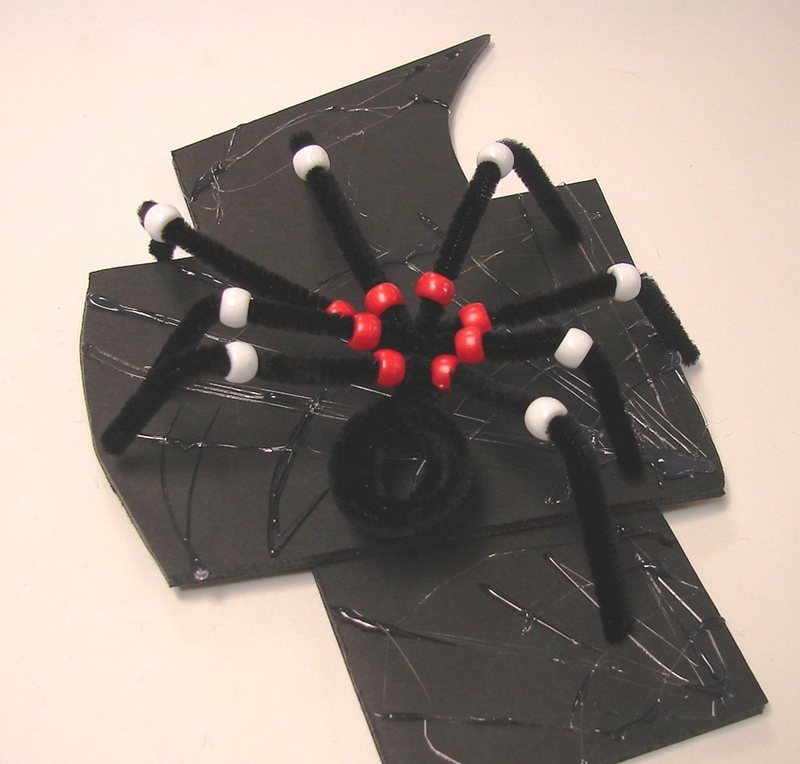 Spider webs are just hot glue applied to a black foam board. Make glue lines out from a corner and then half circles that cut across. 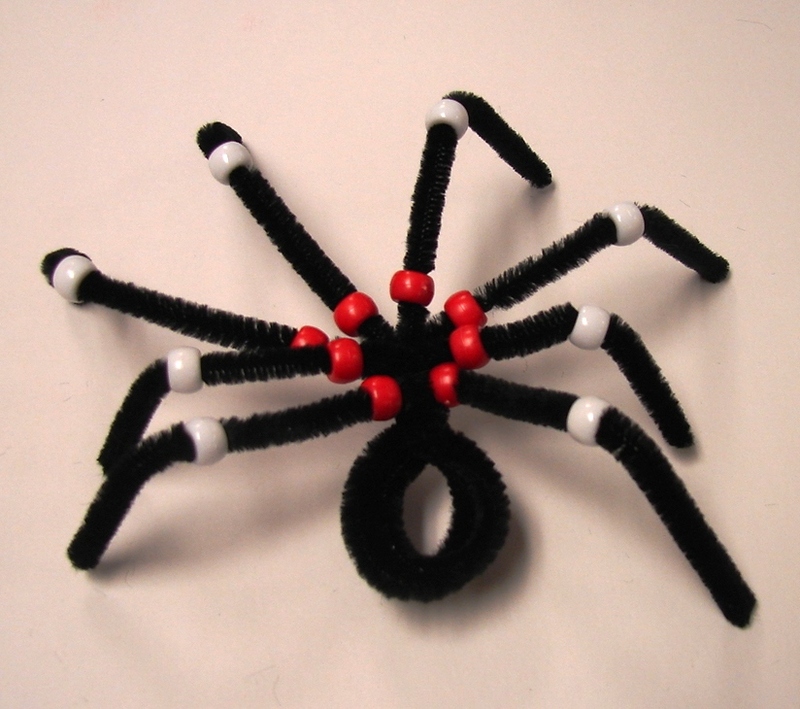 If you want your spider to stay put on the web, apply him while the glue is still sticky. You remember when drawing clowns was a good thing? I grew up in a time when Emmett Kelly and Red Skelton were still known and the Ringling Brothers and Barnum & Bailey clowns were not scary. They were funny and sad at the same time. But not scary. 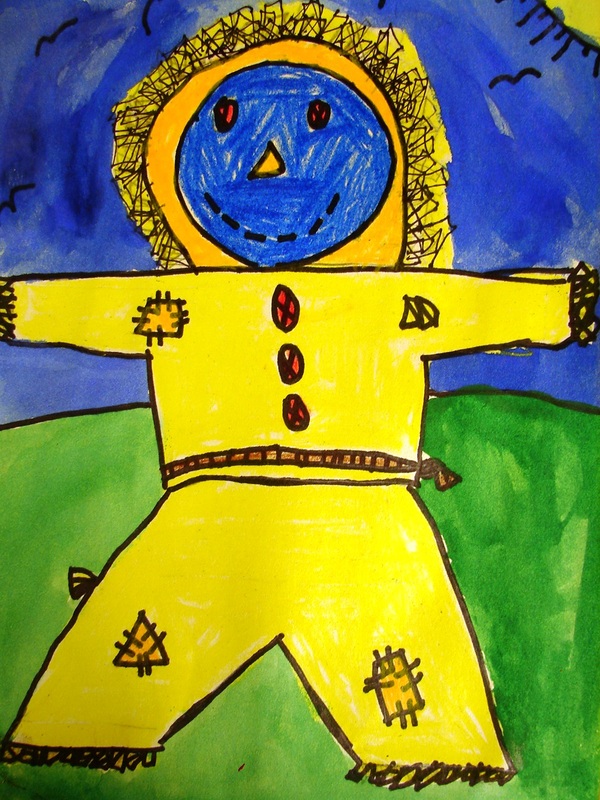 I drew lots of clowns as a child. Now, you say clown in a classroom and the entire room shudders and bursts into horrific descriptions of the clowns they know. 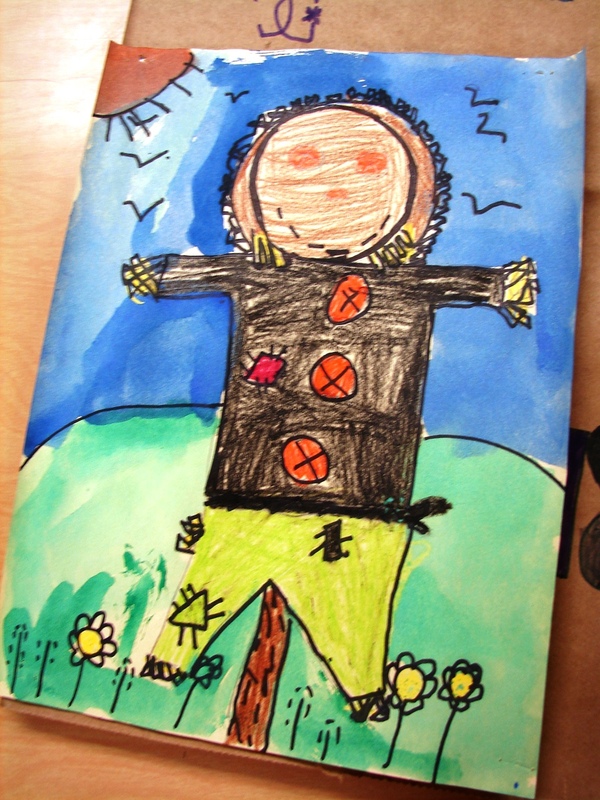 So I substitute these scarecrows. 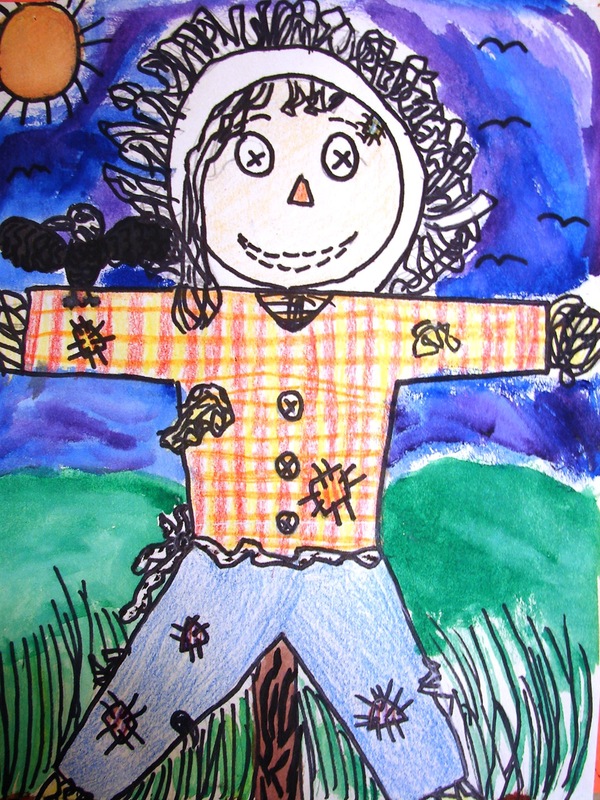 For most fourth graders, scarecrows are still an innocent reminder of the farm, fall and the pumpkin patch. 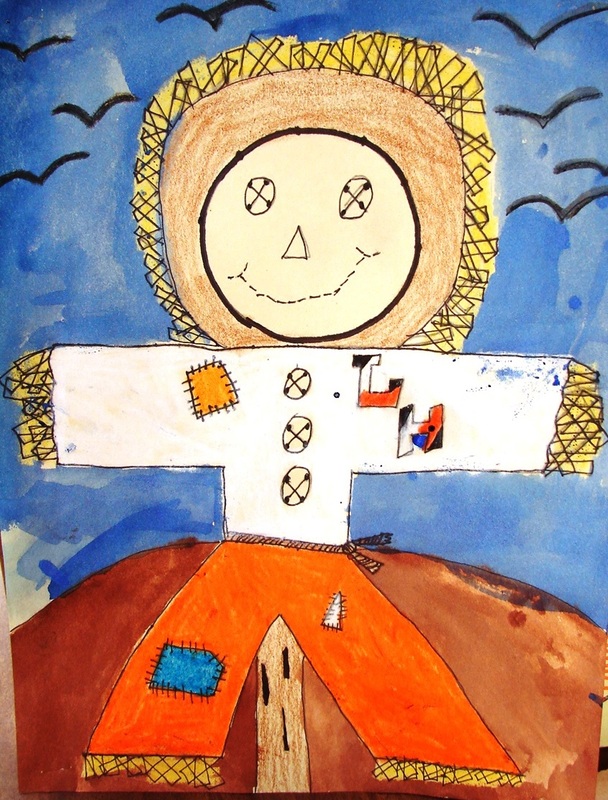 I have a wooden stand in my room where we build a life-size scarecrow some years, but most of the time I use a tabletop scarecrow I bought years ago as a model. 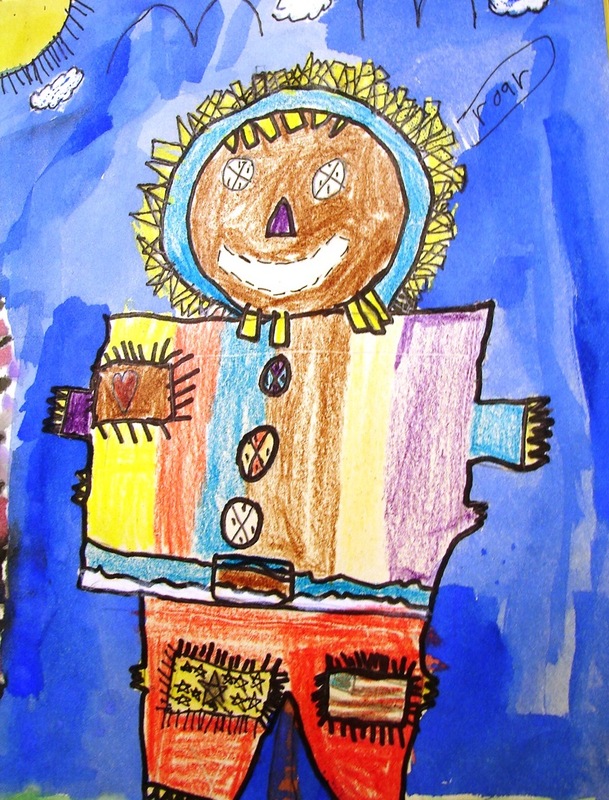 We draw BIG, we start in pencil, outline in sharpie, then crayon for the body and watercolor for the background. The watercolor is a relief at the end because it takes a LONG time to color large sheets of manila paper. Good conversations about color, geometric shaped patches and French fry fingers and feet are had. 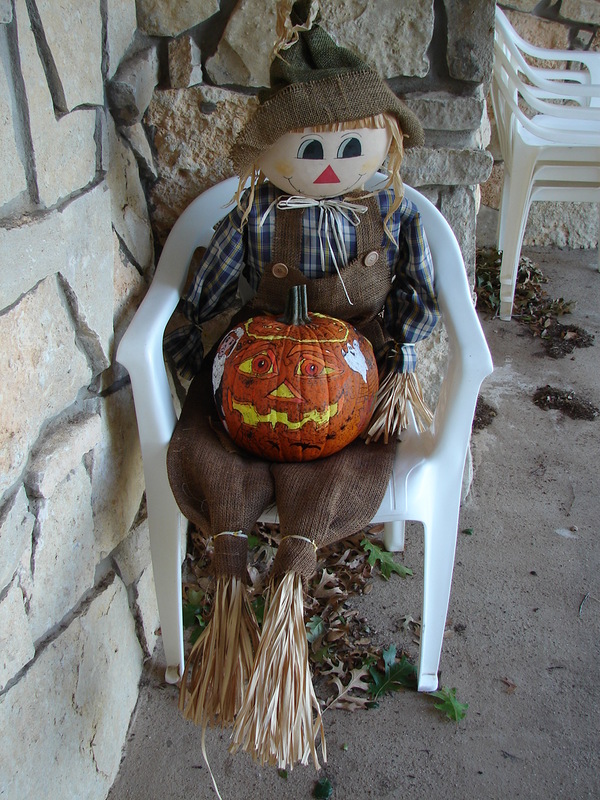 I hope the movie industry and the news media will leave scarecrows alone.